"A chickpea salad garnished with lemons. Warming the garlic and olive oil is optional, but it adds a nice flavor!" Mix the garlic and olive oil in a small microwave-safe bowl. Cook 15 seconds in the microwave on High, or just until warm. 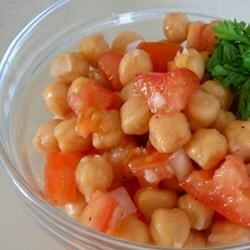 In a large bowl, toss together the garlic and olive oil, garbanzo beans, tomato, onion, and vinegar. Season with salt and pepper, and garnish with lemon slices. Cover and chill until serving. Tasty, healthy and refreshing. Left out the onion and used lemon juice in place of the sliced lemons.